The Great Lakes, which contain about 95 percent of North America's fresh surface water, face threats from "invasive," or nonnative, species, inadequate sewage infrastructure and contaminated sediments. To help restore health to the lakes, Congress introduced two bills last week, but such restoration comes with a lofty price tag. 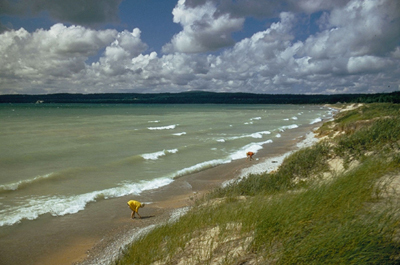 In 2003, about 1,800 Great Lakes beaches (similar to the beach pictured at right) closed due to elevated risks to human health, according to two bills introduced last week. Risks include exposure to viruses, bacteria and other microbes, which can enter the Great Lakes from sewage overflow, as well as from contaminated surface water and groundwater sources. Both images are courtesy of Norman Grannemann, U.S. Geological Survey. The House version of the bill, called the Great Lakes Regional Collaboration Implementation Act, and its nearly identical Senate version call for a total of $23.54 billion in funding through fiscal year 2010. They essentially reauthorize the Clean Water State Revolving Loan Fund  a low interest loan program that helps fund facilities that control water pollution. Most of that funding will help communities construct or rebuild wastewater infrastructure. About half the funding, however, would go directly toward the Great Lakes region to assist protection and restoration projects for key issues, as outlined in a strategy developed by the Great Lakes Regional Collaboration. In 2004, President Bush created the collaboration through an executive order and tasked it with developing an action plan to restore and protect the lakes. The plan involved eight strategy teams, composed of Great Lakes experts representing federal, state, city and tribal agencies, as well as non-governmental organizations and private interests, identifying priority areas. Introduced April 5, the bills stem from that plan, which is "a comprehensive assessment of what the needs are," says Norman Grannemann, the Great Lakes program coordinator for the U.S. Geological Survey, who is an active member of the regional working group that helps coordinate federal work in the Great Lakes. Dave Naftzger, the executive director of the Council of Great Lakes Governors, which was one of the main participating groups that developed the strategy, says that seeing part of the plan implemented in pending legislation is "very encouraging." The bills request a "big boost" in terms of funding, he says, which in addition to restoration, could "do some important things in terms of regulation." A large part of the bills focuses on regulations to prevent invasive species, such as zebra mussels, from entering the Great Lakes. Already, more than 160 invasive species have taken hold in the Great Lakes basin, entering from ship ballast water and other sources, causing an estimated $500 million per year in environmental damage, according to the bills. The bills request $42 million per year for an Aquatic Invasive Species Task Force to help combat "nuisance" species. The reason for the bills' focus on invasive species could be because some people think that, compared to chemical contamination, the lakes face greater stress from nonnative invaders, which are "harder to get rid of," says Grannemann. "These are living organisms there that can adapt to new conditions in ways that are hard to eradicate," he says. 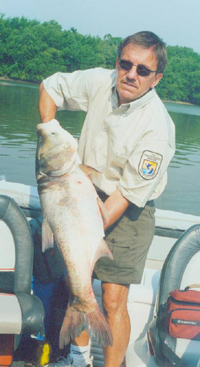 Invasive species, such as this Asian carp, can disturb the ecosystem of the Great Lakes. A recent bill introduced in the Senate proposes adding several additional species of carp to the list of those that are prohibited from being imported or shipped into the Great Lakes. Toxic chemical contamination, however, remains an "area of concern," according to the bills, which would authorize $150 million per year for cleanup of contaminated sediments. A new program that could provide up to $10 million per year in grants for projects to reduce mercury contamination would also be launched under the legislation. A March 16 mercury reduction progress report issued by the U.S. Environmental Protection Agency noted that data on the amount of mercury released into water in the Great Lakes is not available, but contaminations are "thought to be very small." Still, the toxic form of mercury shows up in Great Lakes sediments and water at high enough levels to accumulate in some fish, thus warranting the agency to issue advisories on limiting consumption of those fish. Introduction of the bills was the latest step in an ongoing effort since the late 1960s to restore the lakes. A recent budget assessment found that about half a billion dollars per year of federal money has been spent on various Great Lakes programs, although the exact amount is "not an easy number to get your hands on," Grannemann says. Passage of the current bills will "be a challenge," Naftzger says, whose group has been trying to encourage support for the bills in Congress. He says that "severe obstacles" still exist, such as differences in opinion about ways to manage ballast water discharge from ships. Also, Grannemann says, because the United States currently faces a tight budget, "you can't expect a boatload of money to be dropped on the Great Lakes right now." The Senate version of the bill has been referred to the Committee on Environment and Public Works, which must pass the bill before it returns to the Senate. Grannemann says that he does not expect final votes on the bills to happen anytime soon. But Naftzger says that because this is an election year, "you would expect progress."